The course will arm you with the skills and knowledge to plan the work required according to task instructions to conduct pre-start and post start and routine checks of the forklift truck, transfer and move loads safely including uneven loads and loads at height and carry out shut down and post-operational checks. Upon successful completion of the course, a Statement of Attainment will be issued which will enable candidates to apply for the high risk work licence (HRWL). A Forklift truck is a powered industrial truck that can beused to transfer materials over short distances. It is equipped with lifting media made up of a mast and an elevating load carriage, attached to that is a pair of fork arms or other arms that can be raised 900 mm or more above the ground. There are various different types of forklift trucks however a pedestrian-operated truck or a pallet truck does not include a forklift. Effectively communicate with personnel in the workplace and ensure appropriate methods of communication such as hand signals and two-way radios are adhered to. Understanding manufacturer’s instructions and specifications of the forklift and associated logbooks. 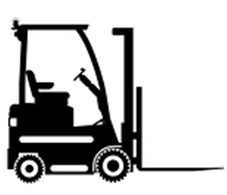 Record all data regarding the maintenance and operations of the forklift truck. The successful applicant will have the skills and practical training necessary to operate a range of different forklift trucks across many industries within Australia. At Emerald, we offer high quality training by our knowledgeable and skilful trainers that will ensure you are confident in gaining multiple employment opportunities within the civil construction industry, manufacturing and beyond.